It’s been one week since radio-surgery, and today is a good day. It was terrifying and horrible, but it’s done! The scariest part was definitely the attaching of the frame (which they call a halo). I cried the whole way through. The doctors offered encouragement, and Mitchell held my hand. I’m not going to go into detail here, but it was the scariest thing I’ve had to do. That part of the day lasted about 15 minutes. Then we had a long wait, and then radiation took about 80 minutes. The radiation part was painless and fine. Then they removed the halo, which was also scary, but quick. They kept me in the hospital for observation for about an hour, and gave me pain medication and steroids (to control the swelling in my head), and then I got to go home. Today, I am feeling good. I am so happy to have this behind me, and to have the good results from the scans. The extreme fear has dissipated into extreme relief and gratitude (although the fear lingers too). I have two visible, little marks on my forehead from where the pins were put in. They look a little like intense bee stings, but they should heal quickly and hopefully will not leave any traces behind. I am still on a lot of medication, and will continue to be so for about two months or so. And it is likely that I will be on anti-seizure medication for the rest of my life (boo! for daily medication forever, but yay! for decreased risk of seizures!). My face is still swollen and I would love to get a proper haircut. Now, I’m hoping to focus on rest and health – healthy eating, exercise, and time with family and friends. Thank you, everyone, for everything. Today is a good day. 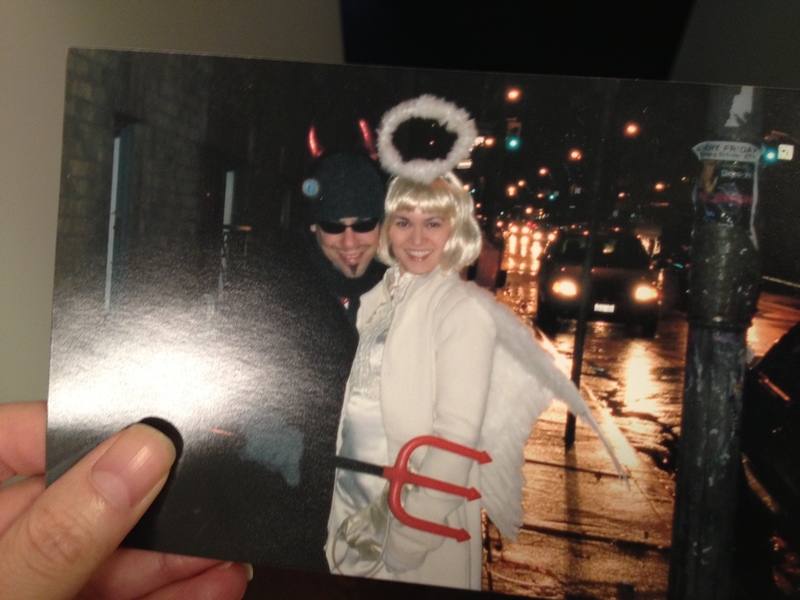 From many Halloweens ago, when a halo was simply part of a costume. This entry was posted in Uncategorized and tagged breast cancer, Family, family photos, gratitude, healing, Home, Life, Love, motherhood, perspective, Princess Margaret Cancer Center, radiation, radiation therapy, radiosurgery, Reflections, resilience, Writing. Bookmark the permalink. YAY!!!! There will be many, many good days, weeks, months, years ahead! Looking forward to spending some of those good days ahead you speak of with you soon. You got through, and that is huge. Here’s to many healthy and hospital-free days ahead. I was so happy to see this blog, having read all your previous ones. You are so amazingly brave, and although we have never met, I feel privileged in having “met” you via your wonderful writing. Oh yes, and I happen to be Helen’s mother. Wishing you continued recovery I send you my best wishes from Montreal. Thank you for reading and for posting a comment! Happy to hear from Helen’s mother! Wonderful news! Rest up gorgeous! Hope to see you soon. Good for you for getting through it! You are so courageous and wonderful! We, too, have never had the pleasure of meeting but we feel that we have gone through this time in your lives with you through your blog. May the future be filled with good health, joy and ease for the entire family. Thank you for your inspiration! Thanks, Eileen and Len. Even though we haven’t met, I feel we kind of know each other (through Eric and by spending time at the Goldmine, a beautiful and welcoming place). Thank you for following the blog and sending good thoughts. So glad to hear that this part is over, and although it was unpleasant it sounds like it went as well as it possibly could. Glad to hear you are feeling better and having a good day. You are so brave – Susan and I are in awe. We are thinking about you, Mitch and Nate and wishing you all well. Naomi, you are doing really well in keeping such positivity. Happy to hear youre surgery is done and you had a good day. Much love and support from Calgary. YOU DID IT! That sounds so scary and awful, BUT what’s the takeaway? You are a victorious champ! Someone hand this girl the Olympic torch already! Love you lady. I’m so glad you got through the radiation. You’re so brave and inspirational. I love your picture of you and Mitchell ! Lots of hugs and positive vibes your way Naomi!! !